Welcome to an interview with Jayde-Ashe Thomas, entrepreneur extraordinaire! Jayde is the creator of the online literary journal, The Paperbook Collective Zine. She also blogs at The Paperbook Blog; makes bound paper copies of the zine as well as Paperbook cards, posters, and bookmarks; sells her photography at a pop-up shop; and recently started a book exchange in her city of Bunbury, Australia. M: Jayde, thank you so much for agreeing to this interview and for spiriting yourself here all the way from Bunbury. You must be famished. What would be your pleasure? Coffee, tea? Something stronger? JAT: Thanks very much for having me Marie! It is an honour to be here. As you know gin and tonic is my tipple, but as it is only 10am over here in Western Australia perhaps I should stick to coffee for now. M: Coming right up. Just have a seat on my couch. I hope you don’t mind cats. That’s what those four furry lumps are along the back of the couch. M: And why she rules (smile). All right, now. We have our coffees so let’s talk. First, in the interests of full disclosure, I should acknowledge that I have had the honor of being published in The Paperbook Collective. But, of course, my interest was piqued long before then. Tell me, what motivated you to start a literary journal? JAT: The Paperbook Collective definitely begun in a very organic way through The Paperbook Blog. When I first started blogging on WP, I was blown away by the sheer content of creative work out there in the blogosphere. I quickly realised that there was no possible way to view it all, or even attempt to keep up with new content on my favourite blogs. I also wanted to push myself creatively. I honestly envisioned The Paperbook Collective as a small 5 or 6 page publication, featuring mainly my own work. But from day one I realised that was never going to be possible…I received over 30 submissions in the first month. M: How do you choose among the many submissions you receive? Are you the only reader or do you have friends or family help you with reading the submissions? JAT: At this stage I basically publish everything I receive. Somehow, miraculously, I tend to receive a fairly consistent number of submissions each month. The submissions are also always fairly evenly distributed between regular and new contributors, which gives a nice balance to the magazine. Every single step of TPC is done by myself, from marketing to editing to designing to publishing to distributing. I am so protective of the magazine that I want to retain complete control, which is probably a bad thing as I literally do not have enough hours in the day to dedicate to it! M: Indeed, publishing a journal, in and of itself, is hard work, but you also write and take photos and make cards and bookmarks, among other things. How do you manage so many creative activities? JAT: Um, right now…not well! I have a lot on at the moment, as I am pushing to establish myself across various creative fields. I am also in the final stages of my university degree, which is time consuming in itself. I am hoping that over the next month things will settle into more of a routine, as I get my shop up and running and then have more time to dedicate myself to my online pursuits. M: (Aside: Oh, my god, she’s a student too!) Jayde, please tell me about your writing. How long have you been writing, what are your favorite forms? JAT: I started writing at an early age, although mainly in the form of journals rather than fictional writing. That is probably why my favourite form of writing is creative non-fiction, and personal essays. I like to write social commentary, but in a light and satirical way. I always try and inject humour into my writing, probably due to a fear that people will think I take myself too seriously. I have just started working for a community website, so I am trying my hand at news articles and features for the first time. Unfortunately I don’t have a lot of time to dedicate to writing at the moment, but having to write for The Paperbook Collective each month keeps me motivated. M: Do you make a point of setting aside days or certain times of the day for writing? What needs to happen for you to say that you’ve had a productive and satisfying writing day? JAT: At the moment a good writing day is probably measured by how many stories I can get up onto the community website. I don’t have a lot of time to dedicate to my personal writing, as every minute that I am not working, I’m reading! The book exchange is my idea of heaven as well as my worst nightmare – I have to fight constantly not to spend every moment of my day nose deep in a new book. I am hoping that once I finish my university degree in August I will have more time on my hands to delve back into my writing. M: You know, one of the things I enjoy about you is your love for books and typewriters. Obviously, you’re not a Luddite, but you do seem to be fighting against the “digital literary takeover” as you describe it in one of your blog posts. How do you address what some might describe as a tension between your online presence—that is, publishing an online journal and engaging in electronic social media—and your love for the bound book, brick-and-mortar bookstores, and the beloved typewriter of old? JAT: That is a very good question Marie! I actually believe that for me, digital and traditional forms of literature are working together to create the perfect fusion. 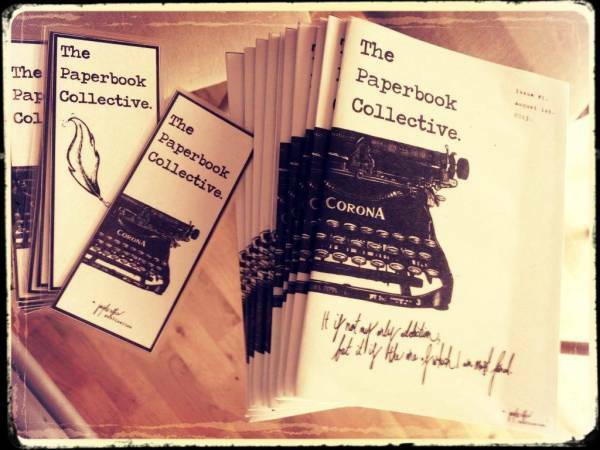 Without the technology that allows me to connect instantaneously with people from across the globe, The Paperbook Collective wouldn’t exist. On the other hand, I am passionate about promoting traditional methods of print production – the printing press, typewriters, paper and ink. These are the roots that allowed us to share the written word. I think it would be a travesty if they were allowed to falter and fade away. I’m not suggesting that everyone go out and buy a typewriter, but I do believe that traditional and new technologies can work perfectly well in cohesion – there is no need for one to move aside to make room for the other. M: I love your philosophy! Now, let’s talk a bit about your photography. When did you take up photography? And, by the way, what is a pop-up shop? JAT: I have always loved photography, and bought myself a decent camera a few years back. I have only just begun sharing and selling it though. I took part in a pop-up collaborative in December last year and was amazed at the response to my photography. The ‘pop-up’ culture is one that I think is becoming huge at the moment. It is particularly wonderful for people such as myself who are starting out in creative ventures, and don’t have the capital, volume of product or desire to open a shop of their own. Basically, you have this opportunity to set yourself up as a stall or miniature shop, literally ‘popping up’ in a location for a certain amount of time before moving on. It is a great way to get yourself and your work out there, without all the stress and hassle that comes from opening a permanent store. M: Lastly, on your blog, you describe how you traveled to Thailand, alone, at the tender age of 18 (I’m old enough to remember that age as being quite tender). Do you have plans (or hopes) for any more travels, or has coming here to Tallahassee, Florida for this interview satisfied all that you may desire travel-wise? JAT: I have decade’s worth of travel plans in my head Marie! Unfortunately, with everything that I have going on right now travel has taken a backseat to creative progress. I actually have this dream that one day I will be able to travel around the world and visit different contributors in their country…and maybe even write a book about it! M: That’s a wonderful dream! Jayde, I’ve truly enjoyed talking with you today. Thank you for coming and sharing so much of yourself and your dreams. JAT: Thank you very much for having me Marie. It is people such as yourself who keep The Paperbook Collective up and running, and keep me motivated when it all seems a bit too much. I’m giving you a virtual hug and a high five right now. This entry was posted in Interview and tagged Arts, interview, Jayde-Ashe Thomas, literary magazine, Paperbook Collective, photography, Publish, Western Australia, writing, Zeus. Bookmark the permalink. Check out this wonderful interview that my friend and Paperbook contributor Marie Bailey did…with me! I am very humbled to be considered worthy of an interview. P.S. I am still accepting contributions to Issue Eight of The Paperbook Collective for the next 48 hours! Great interview, Marie! Jayde is one busy woman. Thanks, Marie! Ugh…I’m having issues with WP. None of the new posts that I follow or follow up comments are coming into my linked up gmail account. Not sure what’s going on. Loved this interview. You set it up so well and those of us who love Jayde liked the personal touch. Thanks, John! I was thrilled when Jayde agreed to the interview. She’s awesome! That’s really amazing. I always feel sad at the way good posts get lost under the pile of new posts all the time, and how hard it is to keep track of them. I think this is a great initiative to keep more of the Blogosphere ‘current’ and who cannot admire someone travelling alone to Thailand at the age of 18 ! Nice to meet you, Jayde. Thanks for the introduction, Marie. Your interviews always come from a creative, refreshing angle. Creative interview – thank you for sharing! Creative people who get things done – love it. I have been a bit low myself…this interview brushed me up! Leya, thank you for reading and commenting. I’m so glad you got a boost from the interview 🙂 Jayde is truly an inspiring young artist! Having done that juggling — trying to be personally creative while also being an editor — I know how harrowing it can be. Kudos to Jayde, and best wishes to you both. Pingback: February Freak Out. | The Paperbook Blog. I haven’t been on WP much lately, so I hadn’t followed up on here with the comments. I have to admit, I am a bit choked up right now. These comments make it all worthwhile! What absolutely beautiful, encouraging, amazing sentiments. Thank you once again Marie. You are so welcome, Jayde!